Starting your degree can be daunting for new students, so we want to help ease your transition to study and uni life with our step-by-step study guide to your first semester at UON. Belong to the university environment and settle in to life at UON. Know the best ways in which you learn and prepare for exams. Use this exercise worksheet (PDF, 1.93MB) to help step you through this first year guide. Take notes to help you discover the best ways you study and learn. Have a sense of purpose – ask yourself why you chose to study at university. Have realistic expectations about uni - the more realistic your expectations, the easier it will be to settle in to uni life. Understand the transition process as a new student - take the time to get used to your new learning environment. Make yourself at home and explore your campus environment. If you're having trouble finding your way around campus during orientation, our friendly staff are here to help. Get your Student ID card and find out about travel concessions. Keep fit and healthy to keep you on top of your studies and help to maintain stress levels. Find out more on preparing yourself for university during Orientation. Get to know other new students through activities and workshops during orientation. Get involved with campus life and check out our campus entertainment. Join a club or society that interests you. Check out our sport and recreation facilities. Get online and know the essential online systems you'll be using on a daily basis. Set up a study space and desk at home. Put together a timetable of all class and study time, as well as work and sport commitments, your social agenda and free time for yourself each week. This will help you plan ahead for assessments and exams and allow sufficient preparation time. Most full time students study four courses per semester. As a general guide, students should allocate 10 hours of study per week for each course. This includes your time in lectures, labs or tutorials and you will need to schedule in research and reading time to support this learning. Take the Uni Ready Quiz to help get you prepared for Uni study. Get help from fellow students with our peer assisted study sessions (PASS). Your attitude towards university matters and can affect how you study, your academic performance and your sense of belonging to UoN. It's normal to experience mixed emotions about starting uni - you may feel initially overwhelmed, then excited by the challenge. if you're considering postponing your studies or leaving university (PDF, 70KB) find out about your options and solutions. Get involved with campus life at UON. Join a club or society and check out our sport and recreation facilities. Create a support network. Know your formal and informal networks at uni and at home. Who are these people and how do they support you? During your studies, you may need to work in groups for assignments or in tutorials or labs. 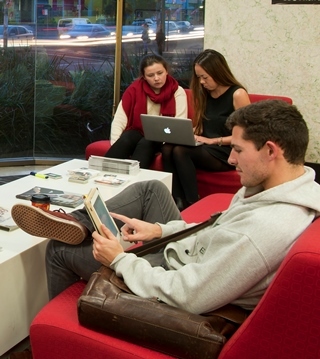 Groupwork can be an effective way to belong academically at uni. You may find it easier to understand tasks, and you can share your ideas and listen to different perspectives. Get to know your lecturers, tutors in your school and faculty. Ask your lecturers for advice if you have questions about your courses. Get to know other students in your classes. Ask questions in class and participate in discussions. Get familiar with Blackboard in UoNline – it's how your lecturers and tutors will communicate your course information with you. See ways to better belong academically at uni through the University Toolbox of Academic Survival Skills (PDF, 715KB). During your first semester, you will hopefully feel more comfortable with your new learning environment. By weeks six or seven, you've most likely received feedback on your first assessment. Whether good or bad results, take this opportunity to improve your academic and study skills, and see ways of dealing with procrastination (PDF, 73.9KB) if this is getting in the way. Keep your work-life balance in check. If you study full time and have a part-time job of more than 12 hours per week, or you have family commitments, reassess your study load to ensure you're keeping up with your uni work. By mid semester you're no doubt enjoying uni life, making great new friends and finding yourself more comfortable speaking with your tutors and lecturers. Form a study group to share your learning experience. Find study strategies that best suit the way you learn. is a self-regulated learner who controls and monitors their own learning. Give yourself enough time during the semester to prepare for your end of semester exams and final assessments. See exam preparation tips and tips on surviving first year exams. If required, it may be possible to withdraw from your course up until the last day of semester. During the exam period, your friends will most likely be studying and your social life might slow down for a few weeks. Keep your family in the loop of your approaching exams and ask for their support. Join a study group to prepare for your exams. Prepare for your exams or final assessments by attending a study workshop, and survive your first year exams. Reflect on first semester after your exams and final assessments are finished. What you have learnt so far about your degree and about yourself as a learner? What does university success mean to you? Increasing ability to navigate uni. Friendships and peer networks at uni. New or modified study skills. Getting closer to career goals. What study strategies have worked best for you so far? What strategies have you changed or developed since starting uni? Check out more tips for success (PDF, 628KB).